I am back on a masks hype, I go through phases where I use a mask every week and then I go months where I never properly use them. Other than the Glamglow one and the Lush mask of magnaminty I tested out for review last month I have had a break from face mask, with me just not fancying trying them, and up until I got the two mentioned above, and this one, I didn't really have many in my collection even if I wanted to use a mask! 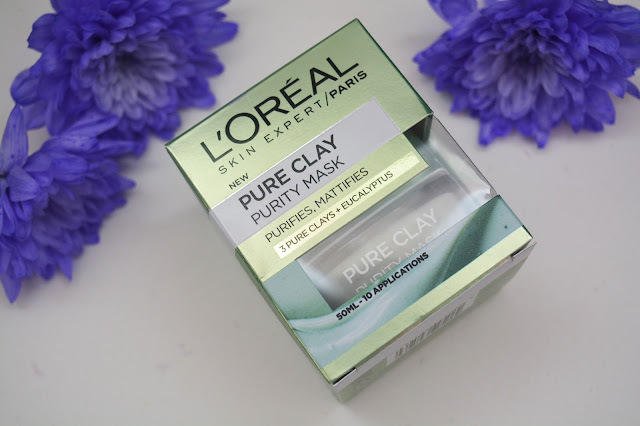 When I spotted the L'Oreal pure clay mask on offer I decided it was worth giving a go and seeing what I thought to it. The product comes boxed in stores with all the information you need to know being given there, which I like as it means the product can have minimal on the jar to keep it looking clean and sleek on my bathroom counter. 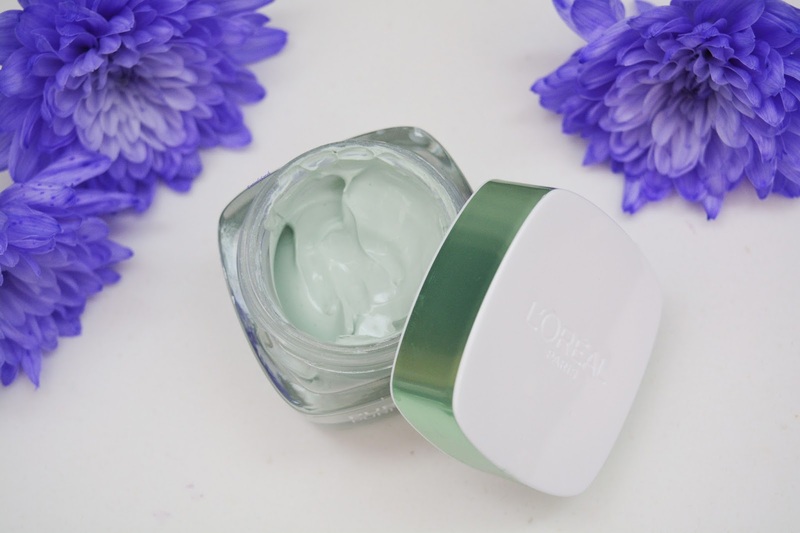 The mask itself is in a sturdy glass jar which makes it feel really luxurious and good quality. 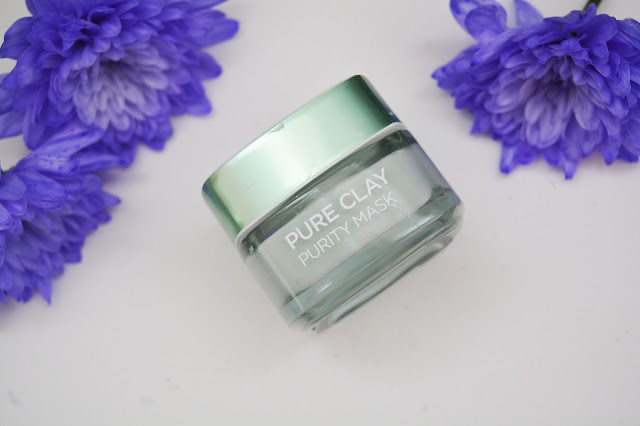 The jar has the simple 'pure clay purity mask' written on thee front to give information on which mask it is from the range, and then on the back it has a simple sticker which tells you it purifies and mattifies, a batch code, the size of the product and how long to keep it when opened, and giving instructions to apply 2-3 times a week on clean skin. The lid is a beautiful slightly metallic green that has a lovely shine to it, while the top of the lid is white with the L'Oreal Paris logo embossed into it. The product itself is a thick light green-ish grey toned clay mask which has a little stopper in the top of the jar to stop it drying out. For me, the scent seems familiar, but the packaging says it has eucalyptus in so I think its that I can smell, it is pleasant though and not off putting. Being a slightly thicker clay mask type consistency it makes it really easy to scoop out and spread on the face without it being to runny and it stays put on the face which is always a bonus. 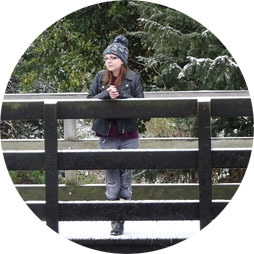 You are able to apply this as thick or thinly as wished and as you can see below the day I took the photograph I went for a slightly thinner layer so it would dry quicker as I was in a bit of a rush. The product applies really well and is advised to be left on for 5-10 minutes and then rinsed off when dry. I found the face mask really nice to apply, and I was able to cover my face evenly and easily with minimal effort. I found the face mask to be a little tingly on the skin when it was first on, but it wasn't uncomfortable, just that kind off 'its working' tingle some masks give when on the skin. Although this says to leave on for 5-10 minutes and then rinse off, I never really time this, I am usually in the bath when I use this so I will just wash my body or read a couple of chapters of my book and then wash off once fully dry. As I mentioned this does tingle a bit when first applied and then feels quite stiff once its dry, which is quite normal across all the masks like this I have tried, so I do tend to wash this off not long after it is all dry just to be completely comfortable as I am not keen on leaving them on for long after they are dry. I do feel my skin is looking nicer since using this, I don't have a lot of problem areas on my skin now, but I do think it is working to clear out my pores with the more I use this, and it definitely leaves my skin feeling softer when I use this. Overall I am really impressed with this face mask, I like the way it applies, and the way my skin looks after using it. Another thing I really like is that it is a multi use product, in my teens I would have always used the single sachet masks and switched it up every week, however now, I appreciate the long term effects of using the same product several times. These retail for £7.99 full price but keep going on and off offer all the time I have noticed. The packaging says you get 10 applications, so although it may seem a bit pricey its less than £1 an application which is cheaper overall than the sachet masks. If you do want to get this mask, or read any more about it, you can find it on the Boots website here, as well as seeing more in the range on the website too if you wish. Let me know in the comments if you have tried these masks, or what your favourite mask at the minute is as I am always on the look out for new ones to try! I've been meaning to try one of these clay masks for a while. I do generally love a face masks and clay ones are usually my favourite.